With more than 11,300 locations in 37 countries around the world that serve, on average, a total of three million customers a day, Dunkin' Donuts serves a lot of iced, glaze,d and sprinkled fried dough. Grab a coffee and one of their 52 varieties of doughnuts (or a croissant doughnut, if that’s your thing) and enjoy a dozen facts about Dunkin'. 1. THE CONCEPT HAS MOBILE ROOTS. Future founder William Rosenberg started his life in the food service industry as a lunch caterer to industrial workers. He used the $1500 he made selling bonds during World War II and borrowed $3500 from relatives to launch Industrial Luncheon Services. Rosenberg started buying taxicabs to convert into catering vehicles, and when he noticed that 40 percent of his revenue came from just two products (coffee and doughnuts), Rosenberg had an epiphany. 2. DUNKIN' DONUTS WAS NOT THE SHOP'S FIRST NAME. When Rosenberg opened his first brick-and-mortar store in Quincy, Massachusetts in 1948, he called it Open Kettle. He soon determined that a better name would sell more doughnuts and coffee, so he put his executives in a room and told them to brainstorm new names. His architect is said to be the one who came up with Dunkin' Donuts, and in 1950, they made it official. 3. DUNKIN' REVOLUTIONIZED HOW RESTAURANTS WERE FRANCHISED. As the company grew, Rosenberg made the controversial decision to franchise. The concept was almost illegal in some states, and franchising was so taboo that companies that mentioned the word weren’t allowed to advertise in major newspapers. But Rosenberg wanted to turn the idea into a respectable, money-making profession. "Franchising supports the great American dream of allowing multitudes to own and succeed in their own businesses," he said decades later. By 1960, he had founded the International Franchise Assn., which still exists today. 4. FRANCHISES STILL USE ROSENBERG'S ORIGINAL COFFEE BLEND RECIPE. It's said that he liked his company’s coffee so much that Rosenberg drank a cup of it every morning. He was also rumored to serve Dunkin’ doughnuts in his home. Now that sounds like an easy way to host brunch! 5. FOCUSING ON THE COFFEE REVOLUTIONIZED THE COMPANY. While the company was by no means failing when new CEO Jon Luther came on in January 2003, his idea to change the company’s focus from doughnuts to coffee revitalized the brand. From then to 2006, when the slogan "America runs on Dunkin'" was launched, Luther brought espresso beverages to the menu, hired a new team of chefs, and redesigned stores with a focus on java. His hard work paid off. Over the next seven years, the company nearly doubled their number of stores and sales increased 66 percent. 6. 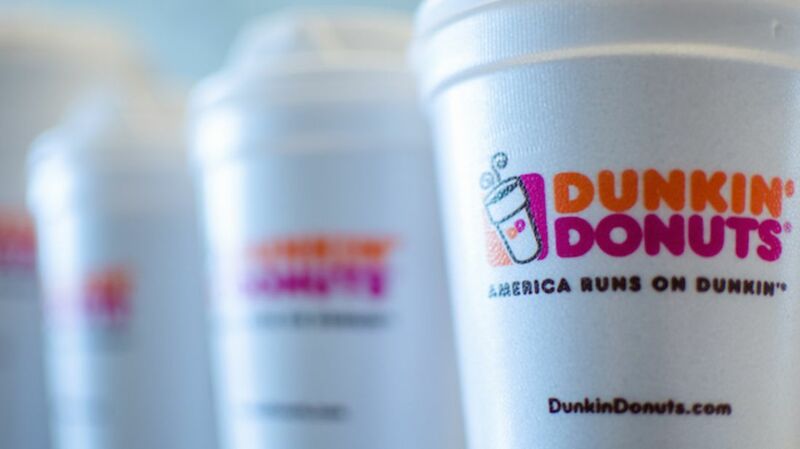 DUNKIN' NOW SELLS 30 CUPS OF COFFEE EVERY SECOND, ON AVERAGE. That amounts to 1.7 billion cups of hot and iced coffee globally every year. All of which are taste-tested by Dunkin' coffee experts who try 200 cups of coffee every day. 7. IT'S NOT ENTIRELY DUNKIN'S FAULT IF YOU SPELL "DOUGHNUT" WRONG. The term "doughnut" was first used to describe a fried ball of dough by author Washington Irving in 1809. The truncated spelling appeared about 100 years later, before the founding of Dunkin’. However, use of the spelling "donut" grew significantly after the company was launched in 1950. 8. IN THE FIRST THREE MONTHS AFTER ITS DEBUT, DUNKIN' SOLD 8.5 MILLION CROISSANT DOUGHNUTS. Based on the Cronut invented by New York’s Dominique Ansel Bakery, Dunkin’ introduced their croissant-doughnut mashup in November 2014 as a temporary menu item. It proved to be such a smash hit, it has stayed on Dunkin’ menus across the country ever since. 9. DUNKIN' HAS ALWAYS HAD A SPECIAL RELATIONSHIP WITH BOSTON. Besides filming commercials with local sports heroes David Ortiz and Rob Gronkowski, Boston-area Dunkin' Donuts, at the request of law enforcement officials, stayed open during the citywide lockdown instituted during the manhunt for the second Boston marathon bombing suspect in 2013. While the company issued a statement that it encouraged everyone to stay home, all were welcome at open Dunkin’ locations, especially cops, who were served coffee and doughnuts for free. 10. DUNKIN' ONCE SOLD AN EASTER EGG DOUGHNUT. As a holiday promotion in 1979, customers could pick up a carton of a dozen Easter egg-shaped doughnuts for just $1.49. The eggs were chocolate-covered and topped with sprinkles, and though the price eventually went up to $1.99 in the '80s, that's still cheaper than a dozen Munchkins. 11. SOUTH KOREA ALSO RUNS ON DUNKIN'. In 2014, the company operated more than 900 locations across the country, making South Korea Dunkin’ Donuts's largest international market. South Korean franchises tend to be busier at night than in the morning, and while you can always get a classic glazed, you can also pick up a black rice doughnut or jalapeño sausage pie doughnut with your bubble tea latte. 12. A HANDFUL OF COUPLES HAVE GOTTEN MARRIED AT DUNKIN' DONUTS. Surrounded by doughnuts, Cliff Ranson and Elizabeth Fischer tied the knot (while drinking coffee) in a Williamstown, New Jersey location in December 2010. The pair said it was their own inside joke, as they had been known to hit the drive-thru twice a night. And they aren't the only lovebirds who bonded over some doughnuts. The chain sponsored a "Hole-y Matrimony Contest" in 2004, and two lucky couples got all-expenses paid weddings at their local Dunkin', complete with powdered doughnut cakes.